Ripon Medical Center has been providing quality healthcare with a personalized approach for nearly 80 years. The facility features 18 private patient rooms – 14 medical/surgical, three Intensive Care Unit, and two labor/delivery/recovery and postpartum rooms. Surgical Services are available on the hospital’s first floor, immediately by the main entrance, and feature three surgical suites and one endoscopic procedure room. Healing spaces have been incorporated into the hospital for patients and families to seek solitude and comfort. A meditation room and healing garden, near the Emergency Department, are key features, as well as a lot of natural lighting. 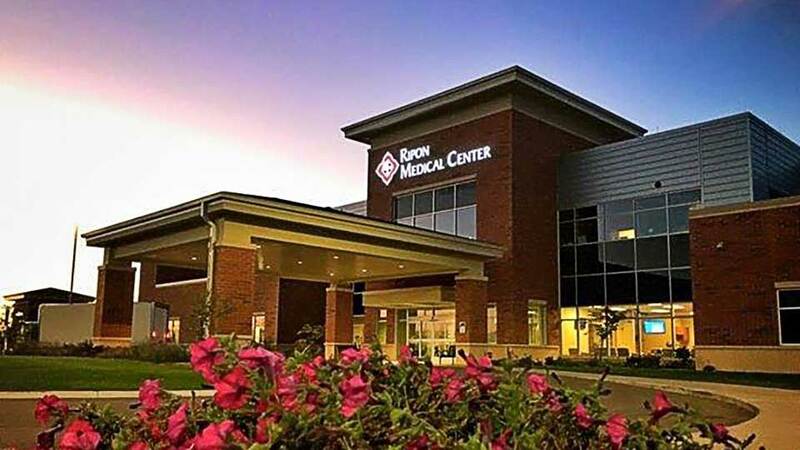 Care at Ripon Medical Center is complemented by hospitalists – physicians that specialize in taking care of patients while they are hospitalized. And, emergency care and urgent care services are available 24-hours-a-day, seven-days-a-week through highly-qualified doctors and nurses in the Emergency Department. These services have a separate entrance (also for night and weekend entry), which can be conveniently accessed off Douglas Street. The RMC Wellness Center is made possible thanks to a generous donation from The Foundation for Ripon Medical Center. It is open 24 hours a day, seven days a week with a large classroom for exercise classes.